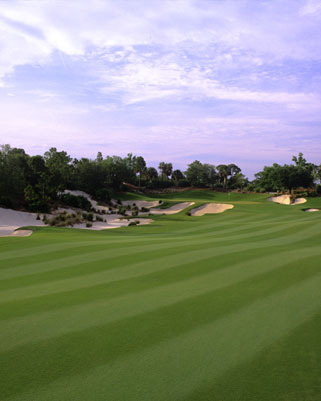 Having played Calusa Pines, I readily agree that this Hurdzan/Fry design (combined with the notable vision of founder/owner Gary Chensoff) has hit it out of the ballpark. From the time you pass through the understated front gate, there’s an unmistakeable “wow factor” that gets your attention like a brushback pitch thrown by Nolan Ryan in his prime. (Sorry, I’m working on a baseball theme here.) 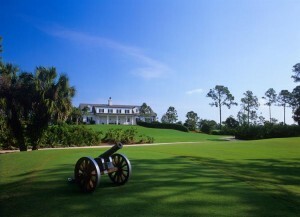 Permit me to cite some examples of what makes Calusa Pines such a special golf preserve. At the top of the list, Calusa Pines is the end result of one of most amazing design, construction and shaping feats I’ve encountered in over thirty years covering golf. Presented with a typically flat, scrubby and mundane piece of Florida landscape, Hurdzan/Fry magically transformed it into a garden spot introducing new elevation, ridges, other land forms, trees and vegetation that come across as wholly natural, native and authentic. And like other masters of the sleight of hand, the architects hide their tricks of the trade to never spoil your surprise. The variety of golf holes and shot values are exceptional. There’s a sensible and modest starting hole (funny how even some of the best courses don’t get this right), short and long par-threes, short and beguiling par-fours, stout and dogleg par-fours and reachable par-fives. All the par-threes are played at various lengths and directions and require pulling a different club from the bag. In fact, most of the holes at Calusa are played at a slightly different compass direction ingeniously conceding to the vagaries of the southwest Florida winds. Simplicity is a hallmark of good design and that’s why I particularly like the par-three third hole. At only 155 yards (back tee), it’s a pedigree terrier for its undersized fight. Played downhill and across a palmetto prairie, the tee shot selection is complicated by being played typically upwind to a small and slightly elevated green guarded left by deep bunkers. Demanding precise and crisply struck shots to find the putting surface, birdies and doubles must be inevitably carded in equal measure here. There’s really no weak or out of place golf hole on the card. And I can’t think of a course that has a better pair of short par-fours, one on each side. The 291-yard eighth hole appears benign but it’s an edgy test of distance control and deft wedge play to an ultra fast green. The day I played it I hit driver leaving me a short but awkward wedge distance to the elevated green. To my chagrin, I promptly chunked it. In hindsight, a three-metal off the tee would’ve been a wiser choice leaving me with a full shot. (In double hindsight, a better wedge game wouldn’t hurt either.) Weighing and making a proper decision at the tee box is another strength of this Hurdzan/Fry design. The playing conditions are equally top-shelf and impeccable. As one member told me, “There’s never an off day at Calusa Pines; we basically have tournament conditions every day.” The Tifeagle putting surfaces consistently stimp at 12+ and roll (and roll…) beautifully. The attention to detail for bunkers, vegetation and overall maintenance is meticulous. And the little “half-way” shack located near the seventh tee and serving several holes is another classy touch. 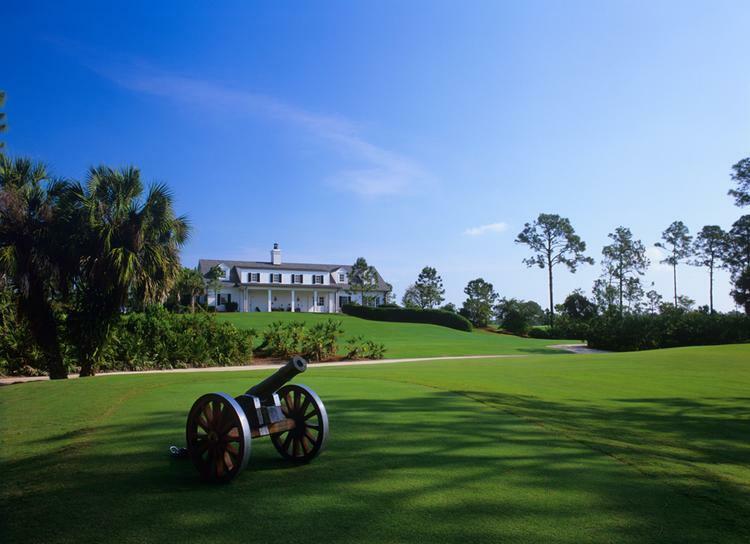 From its excellent caddie program (caddies are required before eleven a.m.) to its attentive and friendly staff, a focus on the game and the experience of Calusa Pines remains paramount and fixed. With a cold drink in hand inside the clubhouse and scanning again the day’s card, I was already imagining a different outcome on selected holes if given another chance.